Who are Kucenski & Voogt? Mike Kucenski and Perry Voogt are two Christian musicians that God has brought together for a purpose. We believe that purpose is to make disciples thru Christ centered music! How do we know God has this purpose for us? Because we worked together in the same praise band for several years, Perry doing vocals & Mike doing drums. During those years I never knew that Perry played keyboards and neither of us knew that we both had songwriting aspirations since our wee teenage years. 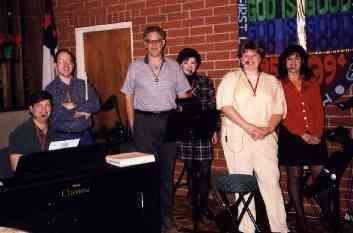 On Good Friday in 1997, we were both performing with Praises Unlimited, our praise band. It was the service of darkness and the music was suitably somber. Sitting in the congregation were Perry's parents. Shortly before the service began, I went over to say hello. Perry's dad asked why we never had Perry play piano, and I replied that we had no idea Perry knew how! Imagine my surprise when he told me that Perry had been classically trained as a youth and had his own garage band as a teenager! Seems Perry was holding out on us. Naturally, I immediately approached Perry about this. He admitted to "once" having the skill, but said he had not played in years. So, we decided it would be fun to get together sometime and play some classic rock & roll. Several months later, Perry and I, got together and rocked on! What fun! And how rusty was Perry's playing? When he sat down at the grand piano, and pulled the keyboard over next to him, and put one hand on each, and started to jam.....somehow it all came rushing back! The man has talent! Anyway, during the next couple of months we would get together occasionally and jam. Time passed by and soon it was nearing the Thanksgiving/Christmas season. I found my self dreading another Christmas season. I wondered where I would find the energy to get through this again. Slowly I came to the realization that I should be rejoicing. I was focusing on the money, shopping, gift giving frenzy, when I should have been preparing for a spiritual experience. I began thinking about how, this year, I could make Christmas more of a spiritual event for myself and my family. What I really needed to do was come up with a "connection", something I could relate to, that would bring the meaning of Christmas closer and more personal. I had no idea what that might be. The morning before Thanksgiving, I found myself lying in bed, with the morning sun coming in my window (that happens in November when you live in California), feeling very peaceful and content. I began to ponder the fact that on the first Christmas Day, Jesus, a real human baby boy, was born. Five fingers, five toes, got cold, got hungry, just like my two boys when they were born. I got to thinking of how I felt when I first held my newborn son and that Joseph must have had that same feeling. Imagine, holding Baby Jesus' hand! Then I thought, what if my baby had been born in a barn? It had to be somewhat disconcerting. What if all of a sudden, angels appeared and starting singing and shouting? Frankly, it seems like it would be a little frightening, at least at first. What an odd and fantastic series of events. What mixed emotions Joseph must have felt! Suddenly I felt very close to Baby Jesus. I could feel the same emotions that Joseph must have felt! It was then that the Holy Spirit gave me the chorus for this song. All at once, in it's entirety, word for word. I immediately got out of bed and wrote down the lyrics. As I proceeded to get ready for work, all of the remaining verse lyrics were revealed to me. Now at this point it's important to note that this was the first real song I had ever written and that Perry and I had not yet worked on a song together. As I drove to work, I could not get the lyrics out of my head and I felt so joyous and uplifted! When I got to work, I called Perry's house and left a verse and chorus on his answering machine (afterwards I felt somewhat silly, but I couldn't help myself). That night at the Thanksgiving eve service, I gave Perry the rest of the lyrics. He was touched by them also and agreed to try and write some music ( he had not written music in 10 or 15 years). A week later, Perry brought me one of the greatest gifts I have ever received, Joseph's Song. When he first performed it for me, I could not believe I even was a part of it because it was so beautiful! After hearing it a couple of times, all I could think was "We should play this for someone else". And that's what we have been doing ever since. To me this is an amazing story and even as I write it, I find myself seeing very clearly how God had the proper time and place for Perry and I to be brought together for the purpose of writing and performing Christian music. God has used us and the music He gives to us several times over the last few years (in some very specific and obvious ways). On the story behind the songs page, you can read about some of the other ways God has directed and used us as His servants. Our prayer for you is that God will touch you through these songs in a very personal way! And we continue to pray that God will "Keep us humble servants Lord, as a canvas for your hand. Use these songs as You will, within Your plan." Lord make us Constant Disciples for You!